Brought to you by Roche’s Pedigree German Shepherds, a premier member of German Shepherd breeders Wisconsin. 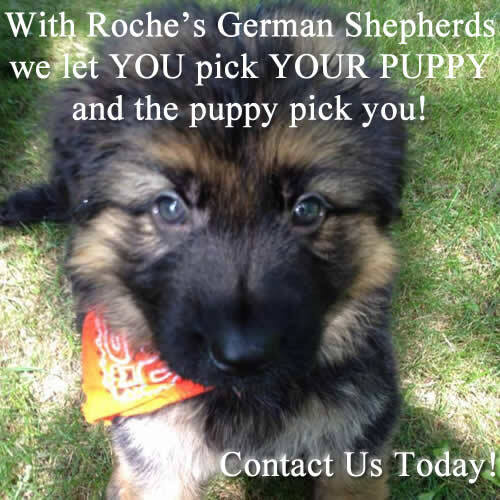 Call Roche’s, the premier German Shepherd Breeder in Wisconsin to Reserve Your German Shepherd Puppy Today! For up-to-date information about Roche’s German Shepherd’s puppies, check back to view upcoming litters. As we confirm pregnancies, we will provide you with the necessary information pertaining to the specific litters. This includes the expected due date of the litter as well as photos of the sire and dam. Since 2009, Roche’s German Shepherds has been providing individuals and families with loyal companions throughout Wisconsin, Northern Illinois, Eastern, Iowa and Chicago. Our healthy, purebred German Shepherd puppies are in high demand due to their athletic, intelligent, and loyal nature. We are the premier German Shepherd breeders Wisconsin. For more information about our upcoming German Shepherd litters and puppies for sale, please contact us at 262-592-3009. Contact Us for more information on upcoming litters or any questions you may have about our German Shepherds.